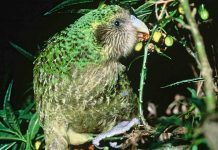 The twelve best photos taken in all the Universe: Whether or not you agree with the great theologian and mythologist, Joseph Campbell, that God is the greatest mystery–indefinable and unknowable, viewing these photographs may create the sense that you are watching God in action. If you don’t believe in a divine being, you will still enjoy these amazing photographs, in celebration of the 25th anniversary of Hubble in space. 20 years ago the Wide Field and Planetary Camera 2 was transported by space shuttle to NASA’s Hubble Space Telescope. 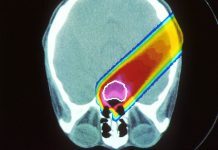 These are some of the most remarkable images photographed since then, especially when utilizing the newer Advanced Camera for Surveys, which makes pictures using ultraviolet wavelengths. 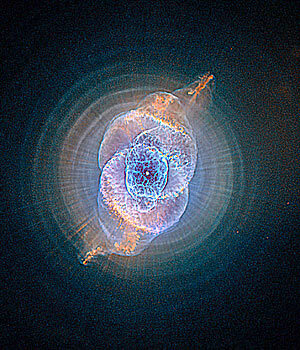 Many of the most remarkable photographs focus on nebulea. A nebula (Latin for “mist”; plural form, nebulae) is an interstellar cloud of dust, gas, and plasma, a place where stars form. 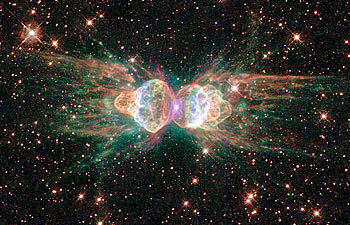 12) The Ant Nebula, is a cloud of dust and gas (scientific name, Mz3), that resembled an ant to observing scientists on Earth who were using land-based telescopes. 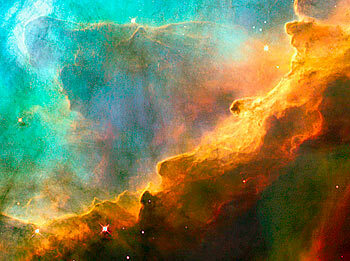 The nebula is found within our own galaxy between 3,000 and 6,000 light years from Earth. 11) Glowing Eyes The cores of two merging galaxies from 114 million light years away in the distant Canis Major constellation form leering eyes. The two mingling galaxies began to merge 40 million years ago spurring new star formation. 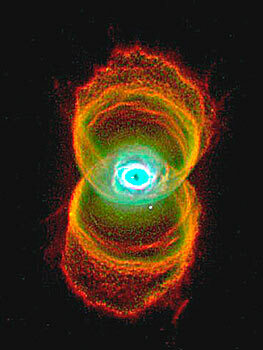 10) The Hourglass Nebula surrounds a dying star 8,000 light years away. Its hourglass shape have been created from stellar winds that are weaker in the core or possibly from an unseen companion star and accompanying gravitational effects. 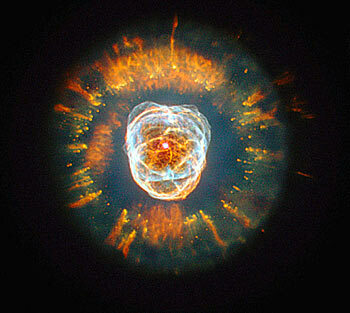 9) The Cat’s Eye Nebula is a planetary nebula in the constellation of Draco. Structurally, it is one of the most complex nebulae known, with photos revealing remarkable structures such as knots, jets and sinewy arc-like features. Did the Lord of the Rings film director base his imagery for The Eye of Sauron on this Cat’s Eye? 8) Starry Night is so named for the way it reminded astronomers of the Van Gogh painting with its spirals of dust swirling across trillions of kilometers of interstellar space. The illumination of dust comes from the red supergiant star at the middle of the image, which gave off a flashbulb-like pulse of light two years earlier. The star, V838 Mon, is located at the outer edge of our Milky Way galaxy, about 20,000 light-years from Earth. 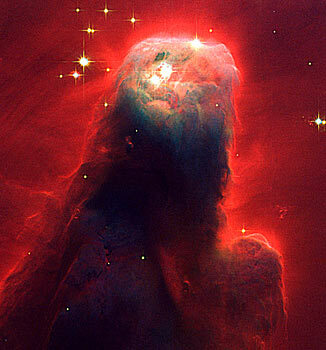 7) The Cone Nebula is a craggy-looking mountaintop of cold gas and dust, a turbulent place where stars are ever in the process of being born. The part pictured here is 2.5 light years in length (the equivalent of 23 million trips to the Moon). is a Sun-like star nicknamed because it resembles a face surrounded by a fur parka. The hood is, in fact, a ring of comet-shaped objects with their tails streaming away from the central, dying star. 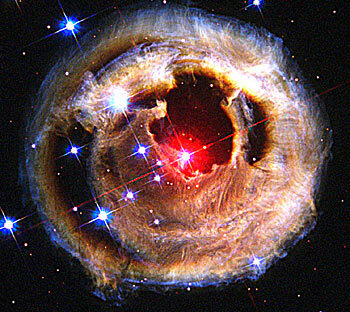 Although the bright central “face” resembles a ball of twine, it is actually a bubble of material being blown outward by the central star’s intense “wind”. 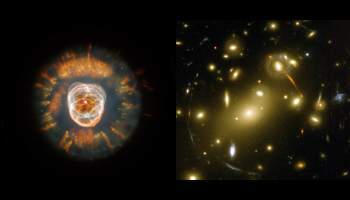 In the second picture, Eskimo, which is 5,000 light years from Earth, is shown next to a hefty cluster of galaxies in the constellation Draco, 2 billion light years from Earth. The cluster is so massive that its enormous gravitational field deflects light rays causing a phenomenon that magnifies, brightens, and distorts images further away. The cluster’s magnifying powers provide a powerful “zoom lens” for viewing distant galaxies that could not otherwise be observed. Thus, the arc-shaped patterns found throughout the picture present distorted images of very distant galaxies, lying 5 to 10 times farther away. Perhaps one of the most famous and easily recognized space objects, this spire is a birthing chamber for stars in the constellation Serpens. “Appearing like a winged fairy-tale creature poised on a pedestal, this object is actually a billowing tower of cold gas and dust rising from a stellar nursery called the Eagle Nebula. The soaring tower is about 57 trillion miles high.” (The nearest star outside our Milky Way galaxy, Alpha Centauri, is 25 trillion miles away or 4.3 Light Years). Stars are born in this chaotic place and their newly-found energy sculpts fantasy-like landscapes in the gas. 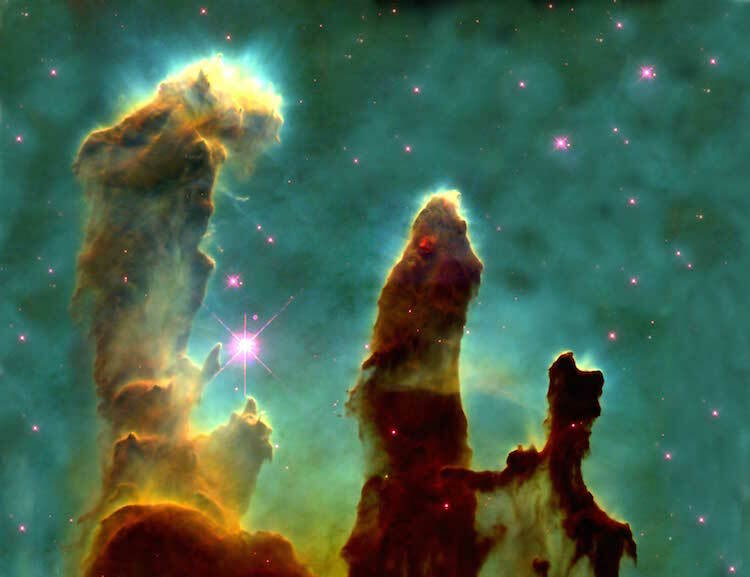 Hot and massive young stars [off the top of the image] are eroding the pillar with torrents of ultraviolet light and illuminating the tower’s rough surface. Ghostly streamers of gas can be seen boiling off this surface, creating the haze around the structure and highlighting its three-dimensional shape. 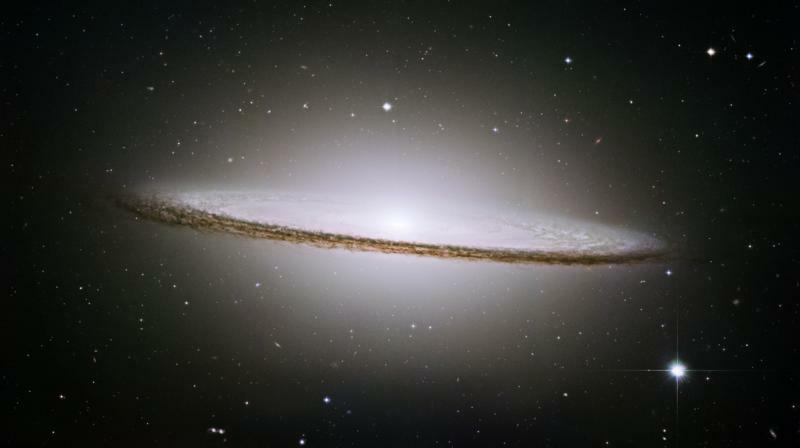 4) The Sombrero Galaxy is 28 million light years from Earth, this galaxy is as spectacular as its appearance. It has 800 billion suns and is 50,000 light years across. Its hallmark is a brilliant white, bulbous core encircled by thick dust lanes revealing the spiral structure of the galaxy. 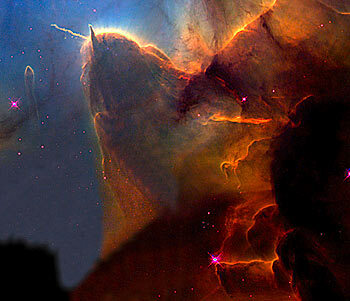 3) The Trifid Nebula is a stellar nursery, being torn apart by radiation from a nearby, massive star. The picture also provides a peek at embryonic stars forming within a cloud of dust and gas, which is destined to be eaten away by the glare from the massive neighbor. This stellar activity is an example of how stars like our Sun are intimately connected with powerful siblings. 2) A Perfect Storm of Turbulent Gases: Omega/Swan Nebula- A small region in the Swan Nebula, 5,500 light years away, is described as ‘a bubbly ocean of hydrogen and small amounts of oxygen, sulphur and other elements. Undersea corral? Enchanted album cover for the rock group, Yes? This is one of Hubble’s most famous images: Pillars of Creation, where stars are forming in the Eagle Nebula. I agree. How lucky we are to live in an era when we can see such beautiful images. I loved the way you framed this piece.. well done! Truly God is an artist, and the universe is his pallet. Incredible sights. They remind us our real education has only just begun. Being able to perceive these images reminds us we’re multi-dimensional and can learn new ways to think about ourselves and the world. 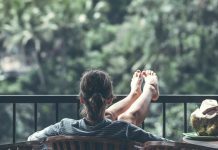 From the moment we let go of self-imposed limits, life takes on new meaning. Breath-taking beauty! I am awe-struck…thank you for sharing such visual miracles with us. The vastness of Space and the beauty of light merging. 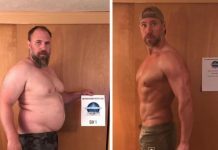 Welcome to the Visible, manifested World! great pictures of our universe!